The Norton Anthology of World Religions offers a beautifully designed library of more than 1,000 primary texts, accompanied by head notes, annotations, glossaries, maps, illustrations, chronologies, and a dazzling general introduction by Pulitzer Prize winner Jack Miles. This collection will unsettle some current certainties about the nature of faith and, in so doing, may help its readers arrive at a nuanced and accurate perception of our predicament in this dangerously polarized world. 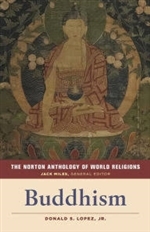 Unprecedented in scope and approach, The Norton Anthology of World Religions: Buddhism brings together over 100 substantial selections from the fifth century B.C.E. to the present day, organized by country to mirror the spread of Buddhism from India to China, Korea, Japan, Tibet, and the United States. The volume features Jack Miless illuminating General Introduction. How the West Learned to Compare Religions as well as Donald S. Lopez, Jr.s; In the World of the Buddha, a lively primer on the history and core tenets of Buddhism. Lopez was born in Washington, D.C. and is the son of U.S. Air Force pilot and Smithsonian Institution official Donald Lopez. He was educated at the University of Virginia, receiving a B.A. (Hons) in Religious Studies in 1974, an M.A. in Buddhist Studies in 1977, and his doctorate in Buddhist Studies in 1982. He is married to another prominent Religious Studies scholar, Tomoko Masuzawa. Lopez is a Fellow of the American Academy of Arts and Sciences and has written and edited many books on various aspects of the religions of Asia. He specializes in late Indian Mahayana Buddhism and in Tibetan Buddhism and commands classical and colloquial Tibetan. In 2008 he gave a four talks on The Scientific Buddha: Past, Present, Future as part of a Dwight H. Terry Lectureship at Yale University. In 2012 he delivered the Edwin O. Reischauer Lectures at Harvard, The White Lama Ippolito. He is a long-term associate of Yale professor of New Testament studies Dale Martin.